Over the last weekend we held a Historical European Martial Arts camp here in Helsinki, at the perfect location of an 18th century sea-fortress with a state-of-the-art training hall with gym and sauna. I personally didn’t take part in organizing the event though I contributed by running a workshop. More on that later. The event was officially organized by our Helsinki German longsword group Vorschlag with some help and backup from the Espoo Association for historical fencing. My colleague Matias Parmala was responsible for most of the organizing and I’m pleased to say everything ran smoothly without any problems. So thank you to Matias and everyone who offered their help. As with every event like this, it would not be possible without the instructors and the students. We had around 35 participants, which pretty much was as many as we could fit into the training hall. The format was single-track, so there was only one class running at the same time. If the event is repeated next year, and we would get more people we will have to consider running two tracks — which wouldn’t be bad at all! Workshops were ran by Finnish instructors from various groups in the capital region and guests instructors from abroad. My workshop was scheduled first so I got the honor to run the initial warm-up for the event (perhaps not a coincidence given my reputation). My workshop then rveolved around the crossed-swords positions in the Bolognese tradition (the strette di mezza spada) and various close-quarters actions that follow from there. We finished with a chance for free fencing. Matias followed with a workshop on basic actions from the German longsword tradition, which was well attended and received. Due to some other commitments I had to skip Matias’s class, but I managed to observe the final part of it, where the material had progressed to the practice of the low-line thrust by mutieren. Matt Galas from Belgium made a brief visit to Finland after his stay in Estonia, and we got the chance to not only show him around Helsinki already on Friday night and enjoy his company, but to learn one of his fundamental cutting drills for the longsword during his workshop. This drill, applicaple to single handed swords as well, is firmly based in the actions of the sources and due to its simplicity and completeness I expect it to become a fundamental part of the curriculum of all HEMA practitioners. I for one am certainly incorporating it! Petter Brodin from Norway finished the day with a workshop on training games for general movement, timing and strength. I must say I enjoyed every moment of this workshop, and while I have loved similar games already for years, I did get some new cool ideas. Not the least the idea of applying the Bolognese point system into the general “slapping game” or arm fencing. Saturday finished with sauna, food, bar and a lot of friendship and socializing. But everybody needed to be fresh Sunday morning for Ties Kool’s dagger workshop. Ties teaches in AMEK, Netherlands and he is one of my favorite martial artists. Put any weapon in his hand and he immediately looks good and knows how to use it. It also shows how much he enjoys teaching, training and fighting. His workshop was about unarmed defense against a dagger or a knife, and I was honored to work as his demonstration partner. I enjoy being thrown about by people who know what they are doing. It is a great learning experience and a lot of fun. The workshop evolved into a drill of free-form defenses against two attackers which made it not only challenging but a great workout as well. The unarmed theme continued by Pyry Veteli’s workshop on over the shoulder throws from the ringen tradition. The floor was a bit unforgiving, but we were able to build up to quite a big throws regardless. I enjoyed this immensely, and it is pleasing to see how Pyry has developed over the few years he has been working on the ringen material. His teaching style is very peaceful and elaborate, very different from the more energetic way of teaching demonstrated by Ties, but equally effective. One of the best things for an instructor like myselfd is to be exposed to different ways of teaching in an event like this. 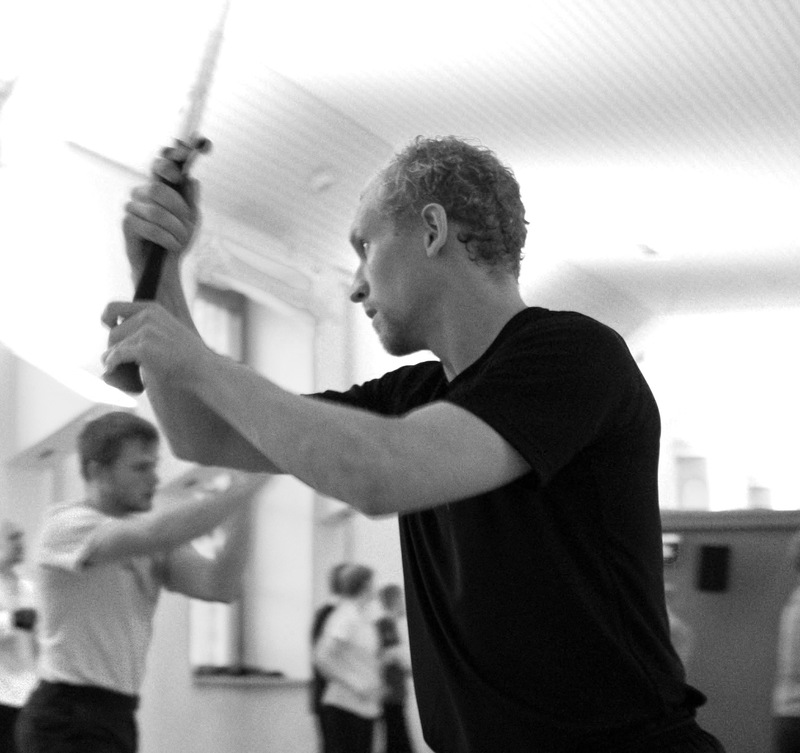 Kristian Ruokonen is emerging as a teacher of efficient free-fencing forms for the longsword. His understanding on competitive or otherwise antagonistic fencing runs very deep and he has a lot to give in tis field. This was last demonstrated by the second place in the open tournament in Dijon earlier this year (in the final he lost to none other than Ties mentioned above), an achievment built on a lot of practice, analysis and observing free fencing. Kristian is interested not only in his own success but also in upping the general level of competitive and free fencing in the community, so he has come up with ways of projecting his experience to others through various types of free fencing games and exercises. My only complaint about his workshop was that I wouldn’t have minded doing it for longer! It was also nice that the class was weapon-agnostic, so I and a few others were able to go through it with sideswords. Final class of the weekend was by Joeli Takala, concentrating on the footwork actions depicted in Johannes Lecküchner’s messer treatise from mid 15th century. It was a brave take on the often somewhat obscure foot positions and descriptions found in the early texts. These actions are challenging to interpret, but I was very pleased with the material Joeli had extracted and the drills he had deviced therefrom. To me the existence of various open-foot positions, loaded steps and so on are evident in the texts. They are not basic material today, but I expect them to be standard in a few years! This kind of workshops are great in pushing these ideas to a wider audience. During Joeli’s workshop I was a bad student for a little while, directing my focus elsewhere. But I think I had a reason good enough to warrant it: from the window of the training hall I was able to witness one of my students, Tuomas Malkki, fence sidesword with Ties Kool at the basketball court outside. Though brief, it was a great display of skill and enjoyment in the art. Tuomas is without a doubt one of the most artistic and subtle fencers in our group, someone I always enjoy fencing with but have great trouble winning. I see myself more of an enabler than a teacher and tend to give credit to the student’s own efforts in training, but I must say I was proud of him and very pleased on how nice their fencing looked. The direction is right. I believe in the not do distant future there will be many of whom I can with confidence say, that their fencing does justice to the masters of old. All in all, the weekend could not have been better. I thank everyone who took part, I hope there will be another one next year and I hope to see everybody there again, along with many new faces!